The game had two different releases and two standalone expansions. See: Version differences and Downloadable content (DLC) and expansions. A demo is available. It contains three single player and two multiplayer levels. Standalone Christmas episode, released commercially in 1998. It also includes the shareware demo levels. It was only available in the US. 2000 re-release of Holiday Hare 98 with a new playable character, Lori. It was only available in limited quantities in Europe. 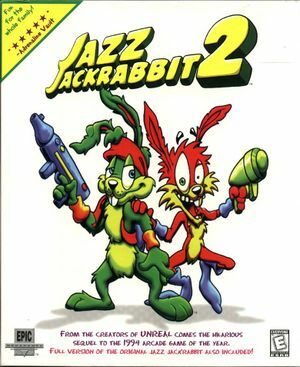 Jazz Jackrabbit 2 is the original release. 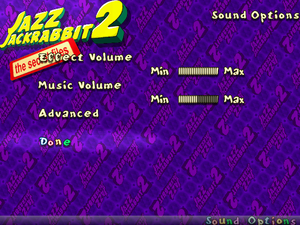 It contains four episodes and the shareware demo levels. 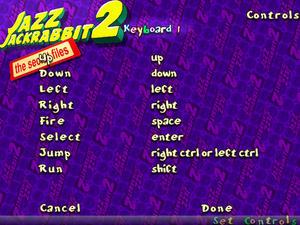 Jazz Jackrabbit 2: The Secret Files is a 1999 re-release with an additional episode and a new playable character, Lori. 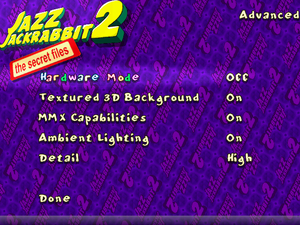 It also includes the shareware demo levels. It was only available in Europe. 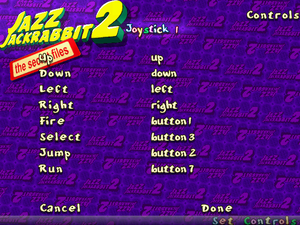 JJ2+ is a multiplayer-focused unofficial patch/mod which fixes numerous bugs and adds a host of new features. It is included in the GOG.com version as a bonus. Make a shortcut with the -menu command line argument. Use JJ2+. Only custom resolutions below 800x600 are supported. Toggle with Alt+↵ Enter or use -windowed command line parameter. Use this hack. Upscales cleanly with mild distortion, includes fullscreen instructions too. Vsync is always on in full screen mode. 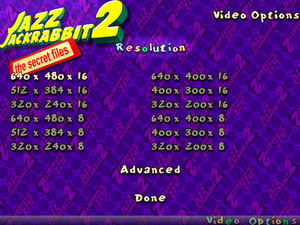 Maximum of 130 FPS in windowed mode. Idle animations with speech are only used when playing in English. Fan translation. Included in JJ2+. Local retail release and GOG.com version. Included in JJ2+. Up to 32 players when 4 players share one computer in split-screen mode. Go to Options, Video, Advanced. Set Hardware Mode to Off. This page was last edited on 8 April 2019, at 11:48.